HONG KONG 1937 KG6 CORONATION REGISTERED ILLUSTRATED FDC + 1c... DAVLIS STAMP CO KG6th Coronation complete set of 3 values on illustrated Registered First Day Cover to New York USA; 12 May 1937; additional KG5th 1c on the back + Davlis Stamp Co boxed handstamp. Please look at my other auctions. Emartenethong kong emartenetfdc emartenetchina emartenetjapan emartenets. 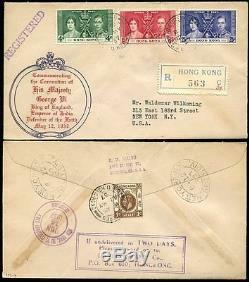 The item "HONG KONG 1937 KG6 CORONATION REGISTERED ILLUSTRATED FDC + 1c. DAVLIS STAMP CO" is in sale since Tuesday, August 19, 2014. This item is in the category "Stamps\British Colonies & Territories\Hong Kong (until 1997)". The seller is "emartenet" and is located in Wild Wonderful West WALES.